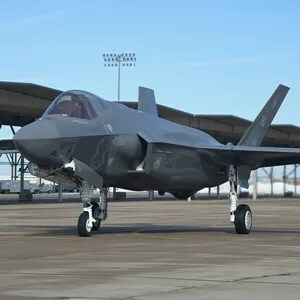 WASHINGTON — The US Air Force on Tuesday declared its first squadron of F-35As ready for battle, 15 years after Lockheed Martin won the contract to make the plane. The milestone means that the service can now send its first operational F-35 formation — the 34th Fighter Squadron located at Hill Air Force Base, Utah — into combat operations anywhere in the world. The service, which plans to buy 1,763 F-35As, is the single-largest customer of the joint strike fighter program, which also includes the US Marine Corps, US Navy and a host of governments worldwide. The Air Force, which follows the Marine Corps in approving F-35s for operations, had a five-month window between Aug. 1 and Dec. 31 to proclaim initial operational capability (IOC). After notifying Congress, Air Combat Command (ACC) head Gen. Herbert “Hawk” Carlisle signed off on the declaration on Aug. 2. In a briefing with reporters Tuesday afternoon, Carlisle stressed that although the F-35A is not perfect, the aircraft has significantly improved from the early days of the program. More importantly, its stealth, electronic warfare and sensor fusion capabilities are urgently needed for future conflicts. “The F-35A brings an unprecedented combination of lethality, survivability and adaptability to joint and combined operations, and is ready to deploy and strike well-defended targets anywhere on Earth,” Goldfein said in a statement. Still, challenges abound. For example, during a recent interim readiness assessment, operational testers found the F-35A’s scope did not always display data in an intuitive manner, necessitating that the pilot hone in on a data point to get more information, Carlisle told reporters. The Air Force, together with the joint program office, hopes to fix that issue in 2017 with its 3F software, which will give the the aircraft its full war-fighting capability, including the ability to launch certain types of weapons such as the Small Diameter Bomb. Other 3F changes, like improved pilot interfaces and displays, will make the plane easier to operate, he said. To reach the IOC milestone, Hill Air Force Base needed at least 12 combat-ready jets capable of global deployment to provide what officials have termed basic close-air support, air interdiction, and limited suppression and destruction of enemy air defense missions. Also required were enough pilots, maintainers and equipment to support the squadron. Asked to spell out what the difference was from the F-35’s basic close-air support capability and a full close-air support capablity, Carlisle declined to go into specifics. “Basically it doesn’t have necessarily all of the attributes” of the A-10, which was built for close-air support, he said. For instance, the airplane was not designed with an infrared pointer. Getting to the point where the Air Force could meet its IOC requirements was not exactly easy, as the F-35 program hit a few unforeseen snags this year. Bogdan announced in the spring that the joint program office had identified instances of “software instability” that would cause the jets to have trouble booting up and, once the software was running, prompt the random shutdown of sensors. Then, Lockheed in June disclosed that the latest version of the plane’s Autonomic Logistics Information System, ALIS 2.0.2, would not be available until at least October. ALIS is the F-35’s maintenance backbone, and is used for everything from mission planning to ordering spare parts. The F-35 appeared to turn the corner after seven planes from Hill deployed to Mountain Home Air Force Base in Idaho. There, pilots and maintainers confirmed they could successfully operate and repair the plane away from home base, even with an earlier version of ALIS. They also demonstrated that Lockheed’s software update had fixed software instability problems, reporting zero glitches during the 88 sorties flown. After that deployment, Carlisle said the current version of ALIS would not be a “limiting factor” that would keep the F-35 from becoming operational. The squadron at Hill then completed its own checklist, which included tasks such as ensuring enough pilots were combat-ready and subjecting them to an oral examination. On July 27, members of Hill Air Force Base’s 34th Fighter Squadron told the press they had amassed 12 modified F-35As and 21 combat-mission-ready pilots and completed all the paperwork needed to make an IOC declaration. Todd Harrison, a defense analyst with the Center for Strategic and International Studies, said declaring IOC is a sign the F-35 program has moved beyond the well-known cost overruns and development issues that marked so much of the fifth-generation fighter’s development. “I’m sure there will still be kinks that come up in the system in the coming years, but for the most part I think this means the program has stabilized, they’re on a good trajectory, [and] most of the potential for major cost overruns and technological challenges are now behind us,” he said. Critics of the program have said declaring IOC is more of a marketing move than an actual operational one, as the service set the IOC requirements itself. Harrison acknowledged that view but said IOC is still an important step forward. Carlisle said in July that even though he would feel comfortable sending the F-35 to a fight as soon as the jet becomes operational, ACC has formed a “deliberate path” where the aircraft would deploy in stages: first to Red Flag exercises, then as a “theater security package” to Europe and the Asia-Pacific. The ACC commander reiterated that sentiment Tuesday, stating that he would deploy the F-35 if its capabilities were needed. Deployments to Europe and the Asia-Pacific, which Carlisle would like to see within 18 months, would help boost partner nations’ confidence in the airframe, he said. Over the next several years, the Air Force plans to stand up two more operational squadrons at Hill. That will entail growing the F-35 maintainer corps from the 222 currently trained personnel to almost 700 maintainers, said Lt. Col. Steven Anderson, deputy commander of the 388th Maintenance Group. Burlington Air National Guard Base in Vermont is set to become the second operational base — and the first Air National Guard base — to host the F-35, and will receive 18 joint strike fighters to replace its F-16s, Richard Meyer, the Air Force’s deputy chief of the F-35 system management division, said in a July 29 interview. The Air Force’s first overseas base, RAF Lakenheath in England, will follow about a year afterward. Lakenheath will be home to two F-35 squadrons in addition to the F-15E and F-15C squadrons it already has. The service is still evaluating which installations to select for the fifth, sixth and seventh operational bases, Meyers said. The fifth and sixth bases will be Air National Guard bases, while the seventh will be one of four reserve bases that currently host F-16 or A-10 squadrons: Homestead Air Reserve Base in Florida, Whiteman Air Force Base in Missouri, Davis-Monthan Air Force Base in Arizona or Naval Air Station Joint Reserve Base Fort Worth in Texas, which is home to Air Force F-16s. “You have to do an environmental assessment to ensure the base meets all the requirements of the environment of the new plane,” Meyers said. That assessment entails evaluating whether new military construction is needed and whether existing facilities need any alterations to be able to support the aircraft. “It just takes a while,” he added. F-35 manufacturer Lockheed Martin congratulated the service on meeting the IOC milestone. “With the F-35A, the Air Force now has a fighter combining next-generation radar-evading stealth, supersonic speed, fighter agility and advanced logistical support with the most powerful and comprehensive integrated sensor package of any fighter aircraft in history,” the company said in a statement. Pratt & Whitney, which produces the F135 engine used in all three variants of the jet, also sent a statement congratulating the service. Be the first to comment on "Air Force Declares F-35A Ready for Combat"